What's the Deal with Water Beads? During this week of LEAP, you may have noticed some squishy yellow and orange beads in the sensory bin. You likely had loads of questions about these little orbs. Well, we love water beads and we especially love how child-friendly they are. Let us put your mind at ease and convert you into a water bead fan! Okay… but what are they? These little beads are made of a water-absorbent gel. They start out small, the size of a freckle, and grow when mixed with water. When squeezed hard enough, the beads will crumble not burst. Are water beads safe for my toddler? Are they reusable? Environmentally friendly? They are reusable! You can dehydrate the beads by laying them on a flat surface and allowing the water to evaporate. Then, simply add water to see them regrow. If you’re looking to get rid of your current stash to make room for new water beads, you can add them to soil. Many brands use environmentally friendly materials that will decompose over time, helping provide your plants with moisture. Stick your water beads in the fridge or freezer for an hour or two for a chilly blast! Keep an eye on them - if they freeze for too long, they’ll become a solid block. Mix colors! You can find assorted colors on Amazon, both individually packaged and mixed. Use a light table! Find a storage bin with a clear lid and place a strand of Christmas lights inside. Lay your water beads on top and watch as the light shines and glows through your water beads. Add a scent! Typically, water beads are hydrated in a bowl of water. Add a few drops of your favorite essential oil (Remember the lavender scented blue rice?!) and tap into another of the five senses. Fill a kiddie pool! Once your toddler has mastered the sensory bin of water beads, take it up a level. On a hot day, fill a small kiddie pool with water beads and enjoy an even more amazing sensory experience. 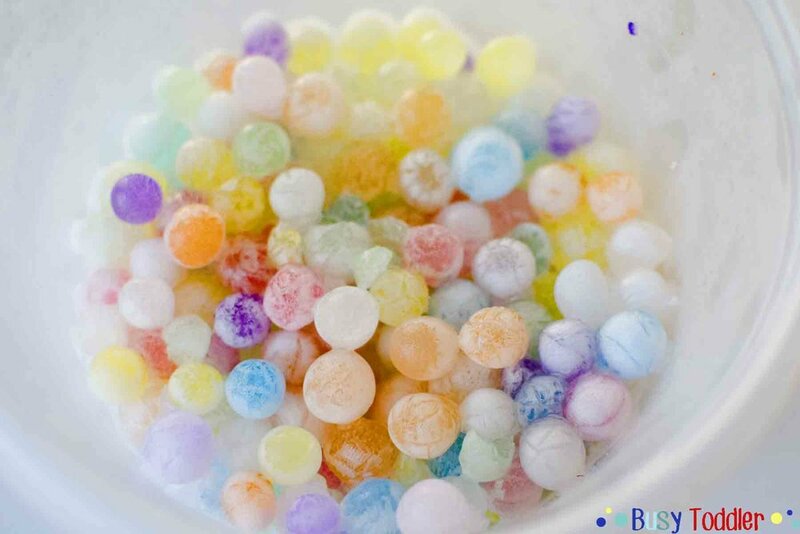 Water beads are one of our favorite sensory bin fillers. From storage to versatility, these tiny beads are the perfect play material to have on hand. Have you tried water beads at home? Let us know!